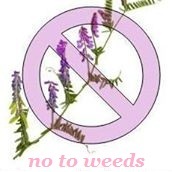 1.Weed Suppression Crops: Where planting a plant that inhibits the growth of weed by barring them from germinating and growing. This “weed suppression” is one of nature’s most effective techniques for establishing plant dominance. Weed suppression crops include barley, oats, sorghum, grain amaranth, alfalfa, sudangrass, pea (Pisum sativum), wheat and sunflower. Choosing weed suppression crops can be helpful in especially weedy fields with decreasing general weed weight. The allelopathic hindrance is intricate and can include the collaboration of various classes of chemicals, for example, phenolic molecules, flavonoids, terpenoids, alkaloids, steroids, sugars, and amino acids, with blends of various mixes in some cases having a more noteworthy allelopathic impact.For instance, one examination that inspected the impact of an allelochemical known in velvetbean, 3-(3',4'- dihydroxyphenyl)- l-alanine (l-DOPA), demonstrated that the restraint by this compound is because of unfriendly consequences for amino acid corrosive digestion and iron concentration balance. 2.MycoHerbicides: This involves using fungal pathogens. Fungal pathogens as a bioagent in controlling weeds are more popular than bacterial, viral or nematodes because, most of the plant pathogens are fungi, which are destructive and widely prevalent, and they can be safely used in organic farming. Phytopathogens normally initiate diseases in specific weeds and produce phytotoxins killing the weeds within 3-5 weeks.Need to find out the availability of these in India. 3.Soil solarization: During summer and fall, organic farmers sometimes sterilize their soil through solarization.During this process, a clear plastic film is placed over an area after it has been tilled.Solarization works when the heat created under the plastic film, which is tightly sealed at the edges, becomes intense enough to kill weed seeds. 4.Mulching: This strategy gives a physical barricade to weed improvement and it is frequently utilized as a part of crops to control weeds (i.e. vegetables, orchids).A mulching material can be anything which is biodegradable in soil. Plastic Mulching: First remove the weeds before the start flowering if they flower they will drop seeds in soil. Then go for plastic mulching choose a plastic gauge 200gsm.It lasts for 2 yrs if not disturbed else will last for short time like 6 months. Controlling grass that leaves rhizome in soil is difficult as rhizome runs deeper burning ploughing won’t work often chemical farming suggests weedicide but along with destroying weeds this destroys soil also one method followed is to let the grass grow n plough it before it sets flower this needs to be done 2 to 3 seasons and it will eradicate the weed completely. Collect root grubs from compost and seed them in the field. They are likely to eat up the tubers for you. Later the biomass could be composted and root grubs eradicated by deep ploughing. The birds would eat them up. Beetles it is part of the biological control. small beetles are collected from a biological lab and released on the plants.they eat and destroy the weeds. need to contact agriculture university biological lab for beetles. The best way to control weeds is to mechanically pull them out. Once they are removed and mulched they add to the nutrients in the soil and help plants grow well. This is a time-tested method followed from ancient times. Any chemical method followed is bound to boomerang on us badly. 6.Grazing: Based on the weeds and their development, we can utilize mammals for grazing, for example, Sheep, goats, bovines and so forth. 7.Crop management: These methods including picking crop varieties, seeding rate, the spacing between plants and crop establishment.The best approach to control weed development is to have highly competitive crops. Ex: Paddy. 8.Robots: Two new mechanical weeders, Robocop (www.garford.com) and Robovator (www.visionweeding.com), for intra-push weed control in push crops are currently working on a business premise. At this stage, the innovation is just valuable in transplants, for example, cabbage and lettuce. Encounters from training are promising and cultivators assert that 70-100% of the work ordinarily required for hand weeding can be spared with mechanical weeders. In weeding, viability gave that the non-specific instruments were directed precisely. Be that as it may, the two automated weeders have more operational favourable circumstances than current low-innovation arrangements. 9.Some of our extra investigations: Allelopathic and bioherbicidal impact of the plant parts buildups from species like Eucalyptus camaldulensis, Melia azedarach, Nerium oleander and so on the development of weeds and yields.The impact of vinegar and citrus acid on weeds, Effect of mustard and different oils on germination and advancement of weed species.